Click here to read our technical brief on antimicrobial stewardship.Antimicrobial stewardship -- which comprises interventions designed to improve and measure the appropriate use of antimicrobials by promoting the selection of the optimal antimicrobial drug regimen, dose, duration of therapy, and route of administration -- is a key component of the global action plan. 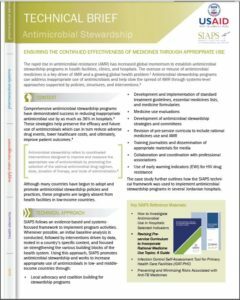 Antimicrobial stewardship activities play an important role in the rational use of medicines, and help health professionals conserve our valuable antimicrobial resources. Work carried out in Jordan by SIAPS and its predecessor, the Strengthening Pharmaceutical Systems (SPS) project, demonstrates how antimicrobial stewardship activities can be promoted in local health facilities. Antibiotics used to prevent surgical infections account for as much as half of all antibiotics used in hospitals but are a frequent source of incorrect or inappropriate medicines use. A study conducted by the Jordan Food and Drug Administration (JFDA) in 2009* found that antimicrobials used for prophylaxis during common surgical procedures, like cesarean section, were frequently administered inconsistently or inappropriately. To help address this issue, SIAPS and its predecessor program SPS provided technical assistance to three hospitals in Jordan to strengthen antibiotic prophylaxis practices for cesarean section. Working with a multidisciplinary team of stakeholders in each hospital, SIAPS helped collect baseline data and was able to make evidence-based recommendations for future procedures. The hospital stakeholders fully owned this initiative, spearheading the development of customized protocols and procedures for the prophylactic use of antibiotics. A cesarean section log, Excel monitoring tool, and indicators were established to help standardize the tracking of antibiotic prophylaxis practices in each facility. Stakeholders from each facility worked together to identify gaps and improve processes -- work that paid off in clear, measurable improvements. Results from all three hospitals show higher compliance with the new protocols and procedures as measured by the use of the preferred prophylactic antibiotic (cefazolin), the timing of administration, and the number of doses administered, as well as significant cost savings. Based on the experience from the three hospitals, the Ministry of Health developed, approved, and mandated in February 2013 a unified antibiotic prophylaxis protocol for cesarean section in all public, ministry-run hospitals. Our work in Jordan shows that even small-scale interventions can lead to big results. In just a few years, the successful implementation of antimicrobial stewardship programs can reduce costs for health systems, save lives, and preserve the effectiveness of essential antimicrobials. This post originally appeared on The Systems for Improved Access to Pharmaceuticals and Services (SIAPS) Program blog. Led by Management Sciences for Health (MSH), and funded by the US Agency for International Development (USAID), SIAPS continues the USAID legacy of improving pharmaceutical management for better health outcomes.